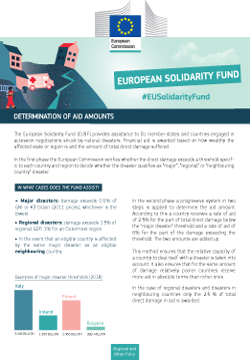 The European Solidarity Fund (EUSF) provides assistance to EU member states and countries engaged in accession negotiations struck by natural disasters. Financial aid is awarded based on how wealthy the affected state or region is and the amount of total direct damage suffered. In the first phase the European Commission verifies whether the direct damage exceeds a threshold specific to each country and region to decide whether the disaster qualifies as "major", "regional" or "neighbouring country" disaster.